On the right are examples of the standard Buffer (part 120) and the slightly later Spring Buffer (part 120a). The Buffer was included in the Inventor's Accessory Outfit B (1920-1923), but not in any other outfits. The Spring Buffer was included in outfit 7 from 1925 (containing four, and then six from 1930), and the later outfit L, but was dropped in the new numeric outfit 10 from 1937. Both parts appear in the November 1941 parts list, but not after that. 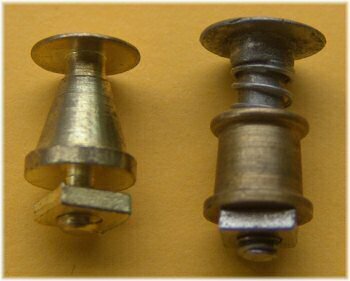 This picture shows the component parts of the very neat Spring Buffer, part 120a. 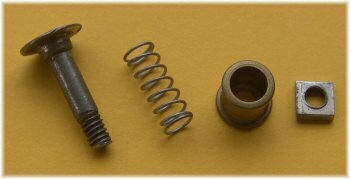 Only one nut is used to attach the buffer, and thus it is the spring itself that holds the part in place. The body is loose on the shaft, pushed against the nut by the spring. After a suggestion in the Meccano Magazine, the spring used inside this part was sold on its own from 1927, and given the name "Spring for Spring Buffer". It was almost immediately renamed to "Compression Spring", and is the only reminder of the Spring Buffer. There appear to be three different versions of the standard buffer, shown in the photo to the right. These are (I believe) in sequence of date. You will note that the first two are larger, around 9.6mm (3/8'') diameter at the head and 17mm in length overall, and the last one is considerably smaller at 7.8mm (5/16'') diameter, although very nearly the same length. However, there are two clearly different versions of the larger type, which will be described as "thinner" and "thicker". In my experience the thinner variety is more common, but not by much. The smaller third type is much less common. The "New Meccano Parts" illustration in the March/April 1920 Meccano Magazine clearly shows the thinner variety of the large buffer, which is likely to be the first one chronologically. The illustration of the Inventor's Accessory Outfit B in the 1922 manual clearly shows the larger type, and if I were to hazard a guess I'd suggest it was the thinner bodied type, although that's not certain. 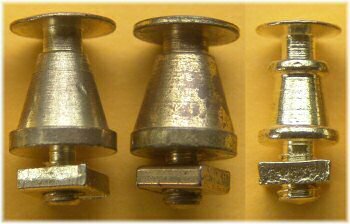 The buffers were never supplied in any outfits, and so the most common source of these is likely to be the Inventor's Accessory Outfit B, which was discontinued just after 1922. This would agree with the thinner bodied earliest types being the most common. The excellent Inventor's Accessory Outfit B shown here is a very late one, from around 1922 or 1923, and contains two of each type of the larger buffers. These could of course have been substituted later, but the rest of the outfit is remarkably original. It might possibly be that this was the approximate transition period. The Meccano Trade Leaflet of September 1931 (pp 376-377 of Volume 6) introduces the Buffers as spare parts in boxes of a dozen. This matches the spare parts pack shown below, which has a picture of the smaller type on it. This suggests that the smaller types are rarer and later. The last price list to include parts 120 and 120a is 1941. There don't appear to be any variations in the Spring Buffer, part 120a, during its UK production from between 1922 and 1941. 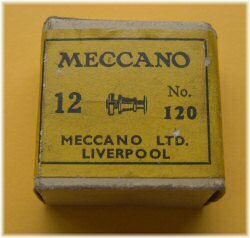 There are other variations on this part, but they are believed to belong to other systems rather than Meccano. Until we get more pictures and information, we can't be certain. The boxed spare parts shown to the right are probably quite late ones, in a white cardboard box. It is interesting to note that the picture on the box label is clearly of the smallest third type of buffer (although we all know that this can't be taken as a certainty). Without an X-ray machine or the inclination to open this packet, we don't know for sure which parts are in it. On the other hand, we don't know the date for sure either, although it is likely to be after 1931 when the boxes of a dozen were announced to the trade. I notice this page is shown for 120 120a, b and c on the main "pick a part". Did something happen to the springs (b and c), or is there a subtly I missed? I had always understood the smaller version of the buffer came from the Hornby train system, wherein for a time they sold an engine and possibly some of the rolling stock in component form. This may help date and sequence the part. Also, the finish on the one you show looks overly bright - perhaps having been polished up? I'm sure Clive or Jeff know the answer to this one! A small typo in the first sentence in the Chronological variations section: these are standard buffers, not spring buffers. Reply: Thank you... I'm glad someone's watching!